Keeping your treasured laptop in top nick is always important but though there are a plethora of black and hot pink bags available, don’t you ever wish you could cart your baby around in something a little more stylish? 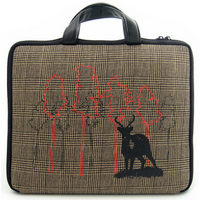 This lovely case is embroidered with a shabby chic-esque deer design and fits laptops of up to 17 inches. The case contains 4mm of memory foam on the inside to hold your baby nice and snug and it has a neoprene outer shell to make it hardwearing..